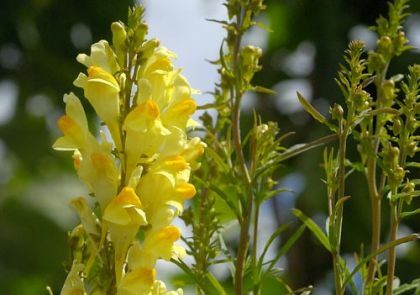 Common Toadflax is not easily confused with other wild plants on this web site. Most attractive perennial of meadows, arable lands and old walls, this stately plant stands 80cm high, bearing wonderful yellow flowers from July to October. The flowers (15-30mm long) – somewhat like small snapdragons – have an orange blush on their lower 3-lobed lips, their upper lip is 2-lobed and their corolla tubes have long slender spurs. The plant is totally hairless and bears narrow, linear, grey-green leaves which are whorled below, and numerous along the stems. This plant was very probably introduced into Ireland and it belongs to the Plantaginaceae family. My earliest record of this plant was at Burrin, Co Clare in 1980 and I photographed it near Tullycanna, Co Wexford in 2006. This species is classed as NEAR THREATENED in the Red Data List of Vascular Plants 2016. 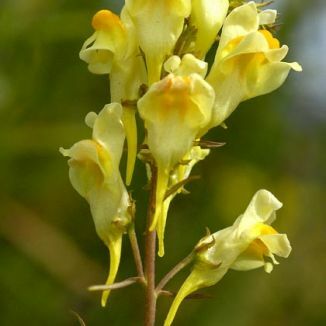 Common Toadflax has many other local names among which is 'Bunny-mouth' on account of its soft jaws. 'Linaria being a kind of Antyrrhinum, hath small, slender, blackish stalks, from which do grow many long, narrow leaves like flax. The floures be yellow with a spurre hanging at the same like unto a Larkesspurre, having a mouth like unto a frog's mouth'.